Not all acronyms are simple to interpret at first glance, and KTFO is one of them. If you come across this acronym online or in a text, here's what you'll need to know about it to better understand its message. You can fill in the asterisks of that third word with exactly what you most likely think it is—the F-word. 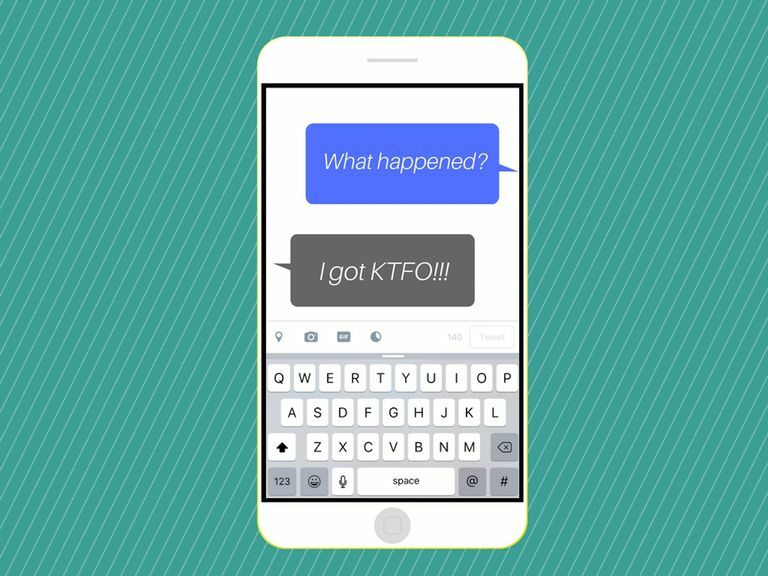 For this reason, KTFO is not an acronym you'll want to send to just anyone! KTFO is basically a much more vulgar version of the simpler expression, "knocked out." The F-word just exaggerates and enhances it. KTFO is typically used to describe the result of physical impact a person might experience from getting punched, kicked, bodychecked, hit, or battered in some other serious way from another person, an object, or an experience. When someone describes themselves or another person as being KTFO, they're saying that they or that other person has either been rendered unconscious or physically hurt (or possibly even both of those simultaneously). KTFO is often used to describe the state of athletes or physically active people after impact since sports tend to be so physically demanding (and sometimes risky). On the other hand, a person might use KTFO to describe the unconscious state a person might fall into from other experiences such as lack of sleep or illness. Friend #1: "Hey did u catch the end of the game last night?" Friend #2: "Yeah tuned in just in time to see Johnson get KTFO by that bodycheck from Bernard!!!" In the first example above, Friend #2 uses KTFO to describe the physical/mental state of an athlete who was bodychecked. Friend #1: "Did you get my text from last night?" Friend #2: "Yeah, sorry I didn't respond. I'm sick so I took some Nyquil and was KTFO until 10 this morning." In the second example above, Friend #2 uses JTFO to describe their physical/mental state from taking sedative cold medicine. KTFO is a similar acronym to BTFO, which stands for "Blown The F*** Out." They're almost exactly the same word for word, but is there really a difference between being "knocked" out versus being "blown" out? The answer to that question may depend on perspective, but if you really want to get specific, BTFO may be more appropriate to describe a win or lose outcome (such as in a competition)—regardless of whether there's a physical component to it or not. KTFO, on the other hand, is probably better suited for describing the physical effects of an event (such as injury or unconsciousness). Some may argue that there isn't a significant difference between the expressions "knocked out" and "blown out," so there's no use in over-analyzing their interpretations in specific contexts. If you want to use either one of them yourself, pick the one that simply seems to sound the most right to you and go with it.